You know your 18 month old better than anyone. Is it a dog, that if properly introduce (on neutral ground) would then accept another dog into it's territory? If so, I, for one, would be thrilled! I love the old grey faced babies!!! I live in the Macon Ga area. I have a beautiful 5 year old Mastiff mix. His mother was AKC registered. The father was the breeder's uncle's black lab. We affectionately call him a 'Mastidor'. We have had Vader since he was a small puppy. We need to find a loving home for him. The work in this area in my husband's field has dried up, and he has been travelling for more than a year to make ends meet. We have explored every viable alternative to having to find homes for our two dogs, but to no avail. If we are going to be able to live together as a family, we are going to have to travel around the country with him,and I knw of noone who can take him in. He is robust and very healthy,in fact, he has never had a single health issue. If you are interested in our sweet boy with the mastiff body and lab personality, please pm me for more informaiton. I've started a new Facebook page called a Home For Every Mastiff, the idea is to bring rescue dogs, rescuers, and people together in one place. It is open to all Mastiff breeds as well as to everyone else. but we still have 11 in florida alone looking for homes!! Remy senior sweetheart good with females & some males. A sweetheart who has waited too long for a home. No national mastiff rescue would take him but thankfully Denise with Maryland Mastiff Adoptions saved him from euthanasia. Remy deserves a loving home that he`will be showered with love. 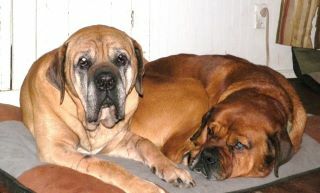 http://www.marylandmastiffadoption.com seniors really need our help! Would it be considered less than tactful to ask if anyone here might be affiliated with a particular shelter? Because if so. . . .this post never existed. Thanks. Not sure of the relevance of the association of a person with a shelter, if you want to know thier affiliations than call them up and ask them or email them privatly. I know myself I have been affiliated with several shelters and am VERY proud of it. I apologize that my post came off the way it did. Honestly, it never occurred to me that it might appear that way. There were two dogs in a shelter that I had called and emailed about and was just trying to get a response on one way or another so I could move forward. I honestly didn't know who, specifically, to ask or I would have emailed them privately. Again, my apologies. Yippeee Welcome home Kane !! Kane removed nice job ladies!!! as this moment florida has 9 waiting for new homes with alot of adoptions pending, but I know there are more still waiting to be evaluated!! I love the rescue thread, but sadly we only have a drop in the bucket of the mastiffs in need posted here. There must be more on this forum involved with rescue. 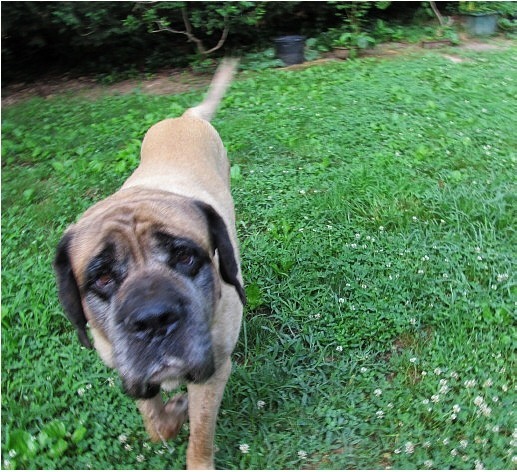 Kira is an 8th old female mastiff good with, kids, cats, & dogs and her foster mom says she is the sweetest dog ever. She was pulled from a high-kill shelter in N.E. when the Great Danes Around New England Rescue crew went there to get a Dane, they could not leave our girl behind ! Or you can contact me and I will get you someone to speak with directly. 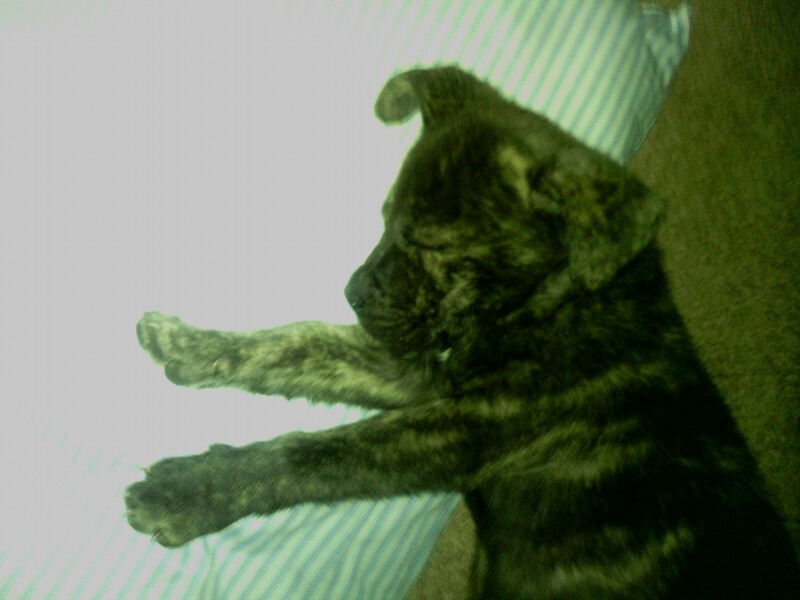 She will be posted on PetFinder soon. Come on new England, let's get another sweet baby off the streets and into a forever home. Lacey with Gentle Ben's Giant Breed Rescue in PA has been adopted to a wonderful home!! Her buddy Cagney is still waiting. Very good news! Willow was adopted today everyone is in love. We will miss this sweet, sweet senior girl! Yippeee !!! Welcome home Willow !! I will remove them, nice work ladies and gentleman!! just being curious. did Daisy get adopted? My prayers go out to Barron!!! I went through something similar (had to have BOTH knees replaced although I worked from home so I had the time) with our last dog so I can understand how they feel. This is a COURTESY POSTING for Safe Animal Sanctuary in Minnesota. You can visit their website at http://www.safesanctuary.org and they can be emailed at safeanimalsanctuary@hotmail.com Meet Pig n Doc---- Pig and Doc are amazing boys, Pig is 4 yrs old he is English mastiff/bull mastiff mix, Doc is 6 yrs old, he is Pig's dad, he is all English Mastiff. Pig and Doc have lived a very sheltered life, Doc is outgoing but Pig never new that there were other people in the world other then his owners. He does bark at new people but not aggressive, once he knows its ok he is in love with people. Doc loves everyone. They are very bonded, they share a dog bed, its very sweet. They would do best in a home with no small children due to that they do play rough. A quieter home would be great for Pig. The do need to stay together!!! Pig is about 110 lbs, Doc around 120, they are both neutered, current on parvo/distemper, heartworm negative and have been wormed. The boys are housetrained, Pig does need to be crated when home alone and at night due to getting into things, Doc sleeps on the couch. These guys are hugable, loveable and amazing!! They do need a fenced yard!! Their adoption fee for both is 450.00. I sure hope this site helps to place some of these wonderful dogs - they all deserve a loving home and their own humans. I have one person who is a current mstiff owner (older mastiff) who is interested in fostering or adopting another mastiff. She is located in KS and I can give her your contact info if you have need. What happened with Rocky the older mastiff who's owner moved away did he get a new home? Just some of the dogs avail in florida many more not listed. Do we have anyone in Florida who can help save a mastiff by fostering??? Mastiff Rescue of Florida has seen a lot of changes in this their first year of operation. 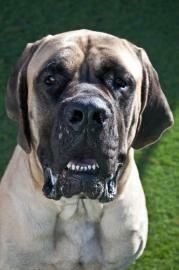 We have placed approximately 50 mastiffs since October 2011. We lost Anne Santora this summer – a good friend to all, a valued Board Member and our Transportation Queen. Our current Board, Jan Stephenson and Susan Prickett, want to welcome Pam Boswell of Palm City to the Board. Last year, Pam asked if she could take a rain check as she was going to school – this year, we are thrilled to have Pam aboard. Welcome, Pam!! You are just in time, Pam. Currently we are dealing with an explosion of mastiffs here in Florida and now have more than 20 mastiffs in our program needing new homes. 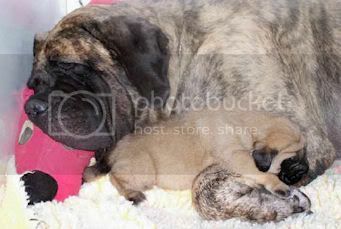 How we have continued to cope with the influx of mastiffs never ceases to amaze us. As always, foster homes are critical and we presently need about five or six more right now so all our evaluated mastiffs will have a safe place. Our foster homes are fantastic and number nearly sixteen to date. 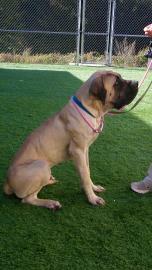 We are getting some wonderful mastiffs, as well as some great homes. We are so pleased to work with all the families who adopt – and the families coming back to us to adopt again tell us that we are doing something right. 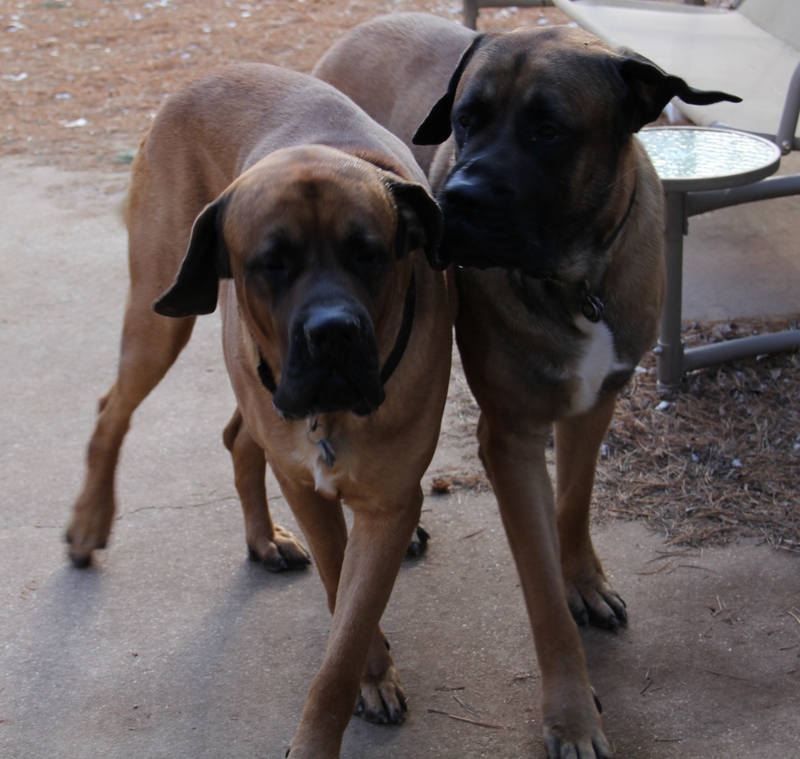 The mastiffs they are getting are a good fit, are in good health and they know we are as close as the phone or an email if they have a question or want to share a special moment with us. Our mastiff and home evaluators are doing a fabulous job – in many cases getting the mastiffs evaluated in a day or two and most home visits set up in less than a week. Last weekend, the fast action of Bob and Nancy Scheltes saved a mastiff’s life. Lani was being kept out of the house on a deck in the full sun, a very hot and humid day. We do not think she would have survived had they not shown up when they did. While it was not part of the plan, they took her home with them. 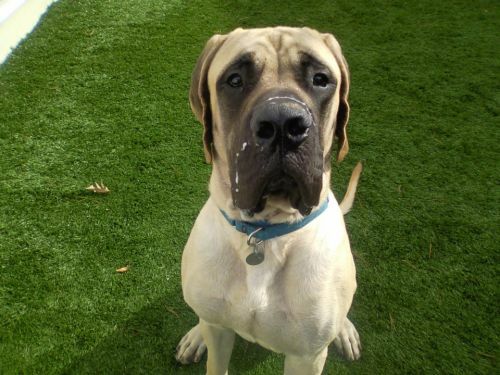 Katie Bower somehow manages to keep the applications and approved homes flowing – along with notifying all the approved homes of mastiffs as they enter our program. Our network of volunteers continues to grow on a daily basis. Many of our volunteers have adopted from us. We continue to gain support from different rescues and other non mastiff folks with which we come in contact. We have some really exciting things going on here in Florida. Good camaraderie, good folks and great mastiffs. We are looking forward to having a fantastic time at the picnic and auction in November at the FAME Bash in Ocalal in memory of Anne and to make new friends and see some of the old ones (friends we have known for awhile – not ‘old’ friends);-) All will be welcome – mastiffs and people. Check out our facebook page – AND in a few more days, we will have a new and exciting website to visit. Once it is up, keep checking it out to see what’s new. Remember that Mastiff Rescue of Florida – is not new! We were always Florida folks helping Florida mastiffs. Florida was part of Southern States, but since 45% of the mastiffs in SSMR came from Florida, it just made sense that we look after our mastiffs. The volunteers in Florida are really good at it. We are the same folks doing the same thing we have always done, only doing it better – helping the mastiff breed. It is ALL about the mastiff!! If you can – we would love your help. Send us an email and let us know – who you are, where you live, your phone number and email – AND what YOU can do to help. Hi all, I'm looking for some advise. we rescued an 8 week old corso from a shelter. She is so tiny, only 6.5 pounds, however, she is height- weight proportionate... because she is so small, people tend to think she is a pittbull. The mother was bred at 7 months to a large, 240 pound mastiff, then left to fend for herself. The county step in and rescued the dogs 1 month before she gave birth. She was covered in fleas, flies, had worms and was extremely under weight. She gave birth to 8 puppies, 7 survived, but she didn't have any real mothering instincts. The rescue where we picked her up from hasn't returned my email or phone call, after i gave them the $300 for the puppy it's like they disappeared. When we brought her home she attacked her food bowl for the first 2 days, like she never ate before, she was constipated and it seemed like she was just learning how to drink water. I honestly don't think she as well cared for and i think she may be younger than 8 weeks.. My concern is how do i help this puppy reach her full potential. Foods, supplements, exercise? She really is smart,comfortable in her crate uses puppy pads when we don't make it outside and already has this instinct to protect the house and yard, mind you, we've only had her for a week. I hope i wasnt too long winded, but i wanted you to have a general idea of how Ladybugs first 8 weeks have been. Any advice you can provide us with will be greatly appreciated. Conan is located at S.A.F.E. Sanctuary in Minnesota. Does anyone here speak spanish ? 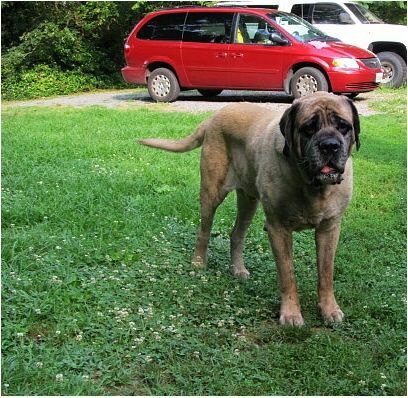 I have a posting with a pic of a Mastiff in need of help but have no idea where and I cant read it ! I did that earlier today and it and it was from Buenos Aires. 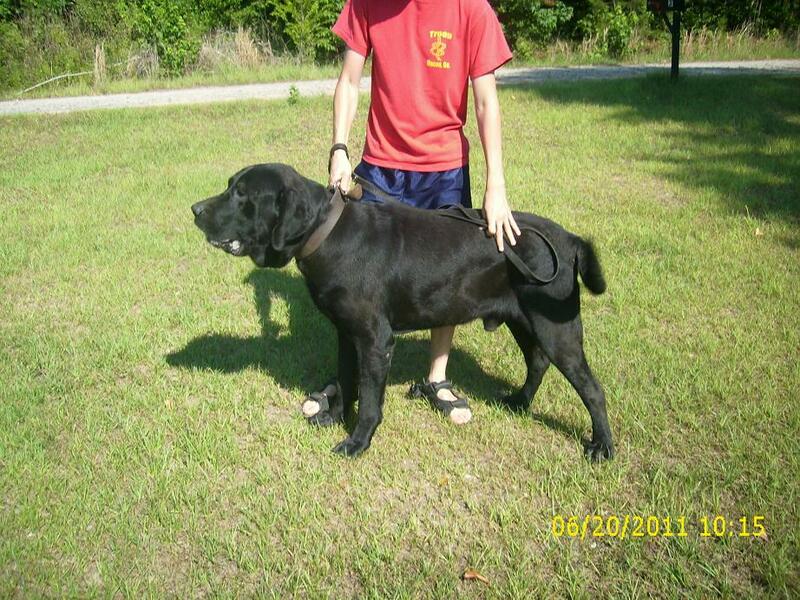 The dog was absolutely beautiful but only about 80 lbs Im guessing - based on what Cyrus looked like when I rescued him. Thankfully he has been adopted !! There is a dog rescue there Yeah for Buenos Aires !!! Since I am new here I apologize in advance if you all already know of this mastiff rescue. They have many dogs that need homes. Appreciate it. I'll check the website out and read up. The vet we went to said she was between 5-7 weeks, but there aren't too many corsos in my area at all, so I'm having trouble locating a vet familiar with this breed, but I will say, ladybug is steady picking up weight and learning so quickly. She will start puppy classes in two weeks and I've been doing all i can to socialize her; i take her work, the store( not the grocery store though, don't want to upset picky folks), pretty much every where. Sorry everyone I am not sure what happened there, but the info on the dog got posted as the top of the page?? I must have done something wrong, like not had enough coffee If a moderator can put George's infer with his pic for me that would be awesome. He is in a High Kill shelter. Thanks and good morning from Alaska ! I am having trouble removing it. I deleted the post which should have removed it I will keep on working on it. Sorry everyone I am not sure what happened there, but the info on the dog got posted as the top of the page?? I must have done something wrong, like not had enough coffee If a moderator can put his info with his pic for me that would be awesome. He is in a High Kill shelter. Hi! My name is Rosco and I'm a two year old purebred English Mastiff. I came to the shelter with two other Mastiffs through the outreach department because my family could no longer care for us. Despite not coming from the best situation, I'm a huge softie and LOVE people. I could live with older kids (like over 16), cats and dogs and can't wait to find my new home. If you don't mind adopting a dog the size of your couch, I'm the one for you! Hi! 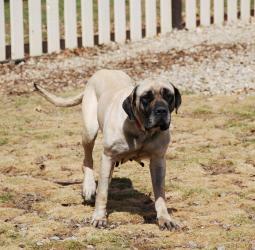 My name is Levi and I'm a one year old purebred English Mastiff. I came to the shelter with my mom and dad through the outreach department because my family could no longer care for us. As you can see from my pictures, I'm quite underweight. The nice people here at the shelter have started getting some weight on me but my next family will need to fatten me up and give me the care I so deserve. I can be a bit shy when I first meet new people but I'm a huge mushball. I can live with kids (older kids, like 16), cats and dogs. If you're looking for a giant love, I'm for you! My Foster, Maggie, romping in the snow! She is HW + but will be undergoing treatment soon. She is 6, but has the heart of a puppy and loves to make you laugh with her antics She is available through Save the Giants.